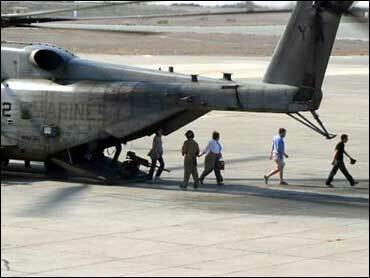 Only weeks ago, it would have been unthinkable: military helicopters flying American citizens out of Beirut. Now, in a city under siege, 64 Americans are known to have escaped by late Monday — but there were signs of movement on the diplomatic front. U.S. Marines are racing to complete evacuation plans for thousands of Americans in Lebanon, many destined to flee the battle zone aboard a rented cruise ship. Hundreds of French citizens and other Europeans, many in tears, boarded a ferry to Cyprus Monday. Within earshot, in Beirut's southern suburbs, Israeli jets continued their assault, CBS News correspondent Elizabeth Palmer reports, while in Beirut's port, a Greek ferry waited to evacuate more than 1,000 people and the first busses pulled up for the mass evacuation. The ship was the first sailing off to safety from Beirut. It was organized by the French government to take out foreign citizens considered vulnerable — pregnant women, families with young children and people who are sick, Palmer reports. Some Americans have driven to Syria in recent days and flown out of the region from there, despite U.S. government warnings that the road journey was too dangerous. It will be Tuesday at the earliest before large-scale evacuations can begin, CBS News national security correspondent David Martin reports. Then, a Greek commercial vessel, the Orient Queen, with capacity to carry 750 passengers, will be under U.S. charter and available to ferry evacuees from Lebanon to Cyprus. "I think we've made a mistake in policy," said CBS News Military Analyst Ret. Army Col. Mitch Mitchell. "When we see a hot war starting, whether it's going to turn into an all out war or not, we should be doing everything we can to get Americans out and I don't think we're doing a good job at all." Meanwhile, just hours after Israel appeared to scale back its demands for stopping the fighting, Hezbollah reacted with a new barrage of rockets fired by guerrillas in southern Lebanon toward northern Israel. Five people were hurt after militants in Lebanon fired a rocket that hit near an Israeli hospital. Security officials also say other rockets hit the normally bustling city of Haifa. People there had already been told to stay in bomb shelters after an apartment building was destroyed by another rocket earlier Monday. Israeli Prime Minister Ehud Olmert said earlier Monday that Israel will continue its strikes against Lebanon until its soldiers captured by Hezbollah are returned, rocket attacks on Israeli cities stop and Lebanese soldiers are deployed along the border. More than 230 people have been reported killed in Lebanon and Israel combined since fighting between Israel and Hezbollah guerrillas broke out on July 12. What Israel expects next from Hezbollah is a strike on the country's biggest city, Tel Aviv, something absolutely unthinkable here before the recent attacks on Haifa, CBS News chief foreign correspondent Lara Logan reports. Israeli troops pulled out of a town in the northern Gaza Strip late Monday, ending a two-day incursion that left behind a wide area of destruction, residents said. About 15 tanks moved out of populated areas of Beit Hanoun and headed toward the nearby Israeli border. Five helicopters hovered overhead, firing flares and machine guns to provide cover for the ground forces. Warplanes also set fire to a gas storage tank in the northern Lebanon neighborhood of Dawra and another fuel storage tank at Beirut airport. The airport has been closed since Thursday, when Israeli jets blasted its runways. Israeli fighter jets also again hit the Beirut to Damascus highway, which has been targeted as part of a strategy of severing Lebanon's links to the outside world. Two people were killed, Lebanese officials said. Eight Lebanese soldiers were killed when Israeli jets hit a small fishing port at Abdeh in northern Lebanon near a highway leading to Syria. Twelve Lebanese soldiers also were wounded. The Israeli army said Monday it destroyed a long-range Iranian missile in Lebanon that would have been capable of hitting Tel Aviv. Officials said Israeli aircraft targeted a truck carrying the weapons before they could be launched. The force of the blast sent at least one missile flying into the air, but it fell nearby. Israeli officials said Lebanese TV stations broadcast video pictures of the incident, erroneously describing the destroyed missile as an Israeli military aircraft falling to the ground. A Hezbollah rocket destroyed a three-story building in Haifa and wounded at least five people, Israeli medics said. The rocket attacks came a day after a Hezbollah attack on the port city killed eight people. Logan's most recent report on Haifa. Israeli bombers continued to pummel Lebanese infrastructure Monday, setting Beirut's port ablaze and hitting a Hezbollah stronghold in attacks that killed at least 17 people. "The bombs started earlier than usual this morning, at about 6 a.m.," said CBS News' Kristin Gillespie in Beirut. An Israeli soldier was killed during a raid in the West Bank town of Nablus, when Palestinians detonated a bomb, reports CBS News correspondent Robert Berger. The army says it has information that militants in Nablus are planning suicide bombings in Israel. A suspected bomber was caught Monday in Jerusalem. An open microphone Monday caught President Bush using an expletive to complain about Syria and Hezbollah, reports CBS News White House correspondent Peter Maer. Olmert told the Israeli parliament Israel will not be held hostage by terror groups. And French Premier Dominique de Villepin, on a visit to Beirut, also said an end to the bloodshed in Lebanon must include the release of two captured Israeli soldiers, as well as a halt to Hezbollah and Israeli attacks. Iran's foreign minister said a cease-fire is possible as well, if Israel first agrees to a prisoner exchange. The problem is the timing: Who goes first? Israel wants Hezbollah first to pull back from the Israel-Lebanon border and release the two soldiers it captured last week, while Hezbollah wants the cease-fire first and then talk with international mediators about an exchange of prisoners. Iran and Syria have applauded Hezbollah's capture of the soldiers, which triggered the Israeli offensive in Lebanon that has killed nearly 200 Lebanese, mostly civilians, and wounded more than 400 others. The two countries are the principal backers of Hezbollah. Israel had previously demanded the full dismantling of Hezbollah as a condition for ending hostilities. Late Monday, Hezbollah dismissed international cease-fire proposals as "Israeli conditions," accusing foreign envoys of allowing Israel time to continue its military offensive to force Lebanon into submission. "The international envoys have conveyed Israeli conditions. These conditions are rejected," said Hezbollah legislator Hussein Haj Hassan. "We accept what secures our country's interest and pride and dignity and not to submit to Israeli conditions," he said on al-Jazeera television late Monday. U.N. Secretary-General Kofi Annan's special political adviser emerged from talks with Lebanon's prime minister to say he would present Israel "concrete ideas" to end the fighting. "We have made some promising first efforts on the way forward," the adviser, Vijay Nambiar, told reporters, while warning that much work needs to be done. One U.N. official said Nambiar's mission had "very useful discussions" with Lebanon's prime minister and parliament speaker — an ally of Hezbollah's leader. "They have agreed on some specifics, and this is going to be carried to Israel, and they will probably go back to Lebanon if they are a promising signal," said the official, U.N. Undersecretary-General for Political Affairs Ibrahim Gambari. British Prime Minister Tony Blair and Annan called for the deployment of international forces to southern Lebanon, and the United States said it did not oppose the idea. But President Bush also suggested, in a moment of unscripted frank discussion caught on tape, that Annan simply call the president of Syria, another Hezbollah backer, to "make something happen. However, Israel opposes the deployment of international forces because it believes it will not help the situation in Lebanon, reports Berger. Instead, Israel wants the Lebanese army to take control of South Lebanon and for Hezbollah to be disarmed. Earlier, in the deepest-ever Hezbollah missile strike into Israel, Katyusha rockets struck the Israeli town of Atlit, about 35 miles south of the border and six miles south of the port city of Haifa. Nobody was hurt. Later, guerrillas fired three rocket barrages into Haifa, destroying the three-story building and wounding at least three people, Israeli medics said. Israel also kept up pressure in the Gaza Strip as it searched for another soldier previously kidnapped by Hamas-linked militants there. It bombed the empty Palestinian Foreign Ministry building for the second time in less than a week in what it said was a warning to the ruling Hamas party. Across the border, Beirut, a city humming with chic restaurants and busy beaches just a year ago, was feeling the sting. Almost overnight, it has all disappeared, and the country has been yanked back to the death and destruction of its civil war years. Deep divisions among Lebanon's people, including over the power of Hezbollah guerrillas, have resurfaced too, leaving many here profoundly depressed. "Everything we built in the past 20 years has been destroyed," said Pierre Ashkar, head of the Hotel Owners' Association. "No one had expected anything like that." Lebanese were stunned at how fast the clock was turned back. Many grew up amid the violence of the 1975-1990 civil war, when Beirut went from being considered the Paris of the Middle East to a no man's land of bombed-out buildings, snipers, constant fear and rabid dogs.